WesBell Electronics is a small company in New Hampshire that requested a Customer Relationship Management system before they start hiring unnecessary additional staff. They already determined that it will be a cost affected approach compared to hiring additional staff. The system will break the CUSTOMERS table into another level that includes CONTACTS, QUOTES, ORDERS and a calendar system called TO DO that reminds the sales person to call the contact. All of the tables will be related to CONTACTS that show how many quotes and orders are placed by the different contacts of each customer. It seems to be very important to WesBell that they are able to distinguish which contacts at a particular company have requested quotes and placed orders. We will provide WesBell with a new portion of the system that digs deeper into their customers and reminds the sales staff to complete certain tasks for each. Since many of their customers have a purchasing contact, accounting contact and an expediting contact, another table in relation to CUSTOMERS will be created called CONTACTS. The contacts can be identified as buyer, purchasing manager, owner, etc. and reports can be generated as such. In this case, a CUSTOMER is related to multiple CONTACTS, but a CONTACT can only relate to one CUSTOMER. The one-to-many relationship holds all of the customer's contacts within the customer table which means reports for contacts are specific to a single customer. The sales people will be able to determine which contact requests quotes compared to which contact places orders. WesBell's big customers have multiple contacts that request quotes and place orders which will require the system to determine which contact to get in touch with during any given situation. Each order will need to reference the contact in order for reports to be generated accurately. Currently, WesBell's staff is making hand notes and using calendar systems within their email software to remind them to call each customer and to follow up on quotes and orders. To make things more consistent and efficient, a TO DO process would not only help the sales staff, but it would also help management review the work of their staff. The process would be to set a TO DO after each quote, order and phone call. It will hold the history of notes within the CRM unlike an email calendar system. From there, the managers can run reports that show which conversations turned into orders more often. That will allow managers to create processes with specific conversation agendas that convert into more orders. When the TO DO is being created the sales person will have the option of a pop-up reminder or an email reminder. The system will also notify the salesperson when they already have 15 TO DO's set on a particular day because that's the maximum amount one person can complete. As the process improves the number of 15 per day may change but nonetheless, they have a clear view of how many are being completed and notes about each conversation. Users typically think about inputting into a system, but outputs are just as important to analyze and improve the company in future years. The CRM technology would also come with a management section that easily generates reports to see how the sales staff is doing. WesBell's management team must have a hard time figuring out how much work is being completed by each sales employee. They must also have a hard time determining when to hire another sales person without the appropriate data to back it up. 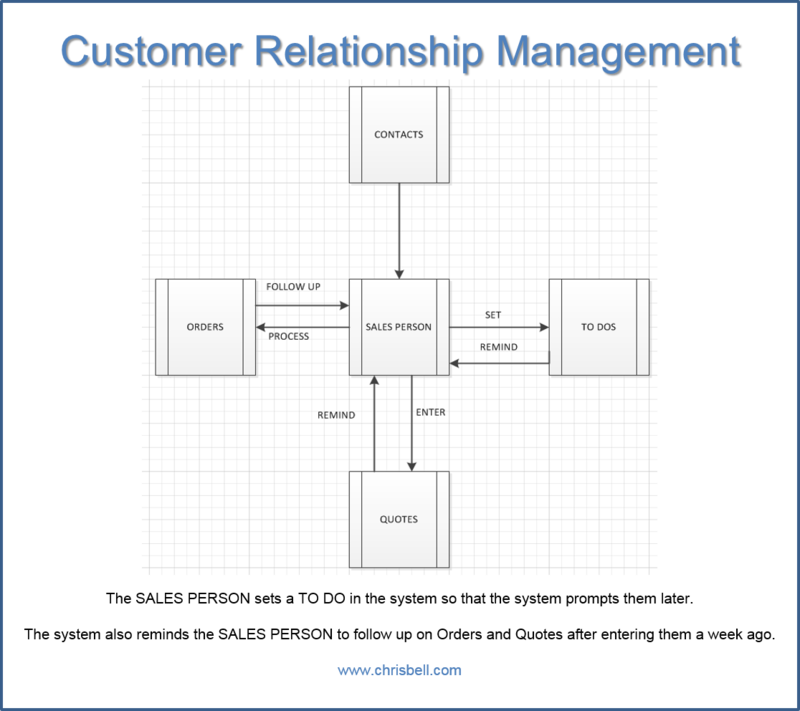 Adding CRM technology to their current system is a must from a manager's point of view. They will be able to view the open and completed TO DO's of each employee, along with the notes written after each conversation takes place. Managers will be expected to run reports and analyze things that are working and things that are not. Managers will also be able to create reports that break down how many of the CONTACTS in their system are purchasing agents, purchasing managers, accounts receivable, or even owners. Each type of contact will need to be talked to in a different manner, so additional management notes can be included as such. We can also set up an automated monthly report to show WesBell how many quotes turned into orders and how many of those contacts had previous TO DO's completed, which will prove that the process works and that each of their employees are doing their job. Managers can also train new staff with more data to back up decisions. Trial and error is useless if the company isn't tracking the results and using the results to their advantage in the future. TO DO's that aren't completed on the day they were set will move into a PAST TO DO section. The salesperson will get a reminder that the TO DO isn't completed and the manager will get an email when TO DO's are more than 5 days old. Past TO DO's don't always mean the sales person is slacking, it can also mean the sales person is too busy. Managers will be able to analyze this data and either use it to evaluate their employees or use it to hire additional staff. Hiring staff is very difficult without data to prove that the company needs them. WesBell's entire process will change by implementing a CRM into their current system, however their concept of following up with each customer will not. Even at a steep cost of $30,000 to $50,000 to implement the system and train the employees, it will be far cheaper than hiring 3 new sales people and training them to do the manual process. Their sales people typically get paid commission and therefore have the same goal as the management team, which is to increase their sales book. It should be easy to train the sales team on the CRM because it will help with their sales goals and possibly their compensation. I don't think it would be a difficult sale to WesBell, nor do I think it would be difficult to train the staff. Since it's a fairly small company it will be easy to train them all together instead of in groups. They also have spent the last few years using the same system, so this will just be an update for them to learn. The CRM is all about calling more customers with less employees, identifying "A" customers quicker, and conducting better customer satisfaction. Customer satisfaction in 2015 has become a marketing approach according to Irene A. Blake of The Chronicle Small Business, "Feedback in the form of solicited or unsolicited detailed praise, or testimonials, is a valuable marketing tool that can help you to attract new customers, retain current customers and build your reputation. Shoppers often actively research several e-businesses, products and services online before making a purchase." It's nearly impossible to determine or calculate the return on investment from satisfied customers, however we all know that spreading good news about a company is better than spreading bad news. That dates back many years before technology, but today news travels at the speed of light compared to the days before technology, either helping or hurting your company in the blink of an eye. We plan to capture all negative feedback and improve the product or process that was complained about. We will also capture the good feedback to make sure they continue doing the things their customers like. WesBell does understand that they have a problem, they just don't directly understand the CRM solution. We'll have to explain it in more depth, and train them to look towards some technology solutions instead of staff during their years of growth. The management team will no longer have to look through the notebooks of their sales team to view which customers have been called. They can use the system to quickly view current TO DO's, open and past TO DO's and a TODO-to-Order ratio. Why does one sales person get 15 orders after completing 30 TO DO's when another sales person only get five? Data can be captured and used within the system to make managers more efficient. The TO DO process will look something like the image below to start, but it will get more in depth in time. The idea is to have an ongoing TO DO set for each contact of each customer when necessary. Contacts will be removed from the TO DO list when the sales person feels they cannot get any more business from them. If there's not a TO DO set there should be a note explaining why. Once the process has been correctly used for some time we'll be able to create reports based on the new data collected. For instance, a list of contacts can be generated that bought a product after one TO DO was completed, or after two TO DO's were completed and so on. This will help WesBell's management team plan for an accurate ratio of employees-to-customers and determine how many TO DO's it takes to get additional business from their customers. Their manual process probably took three times as many people to conduct the same amount of phone calls and emails. The beginning portion of the project plan will be for the systems analyst to conduct interviews with the necessary users, research the company, and research their processes and their system. Some of the things to consider will be the amount of people involved in building the system and how long it will take to build each portion. Furthermore, I'm going to determine and explain how each task affects the next and create a formal Gantt chart that shows which tasks have predecessors. Projects are based on time and money, and both need to be watched closely in order to stay within the budget. The entire project involves planning, not just the execution portion of it. 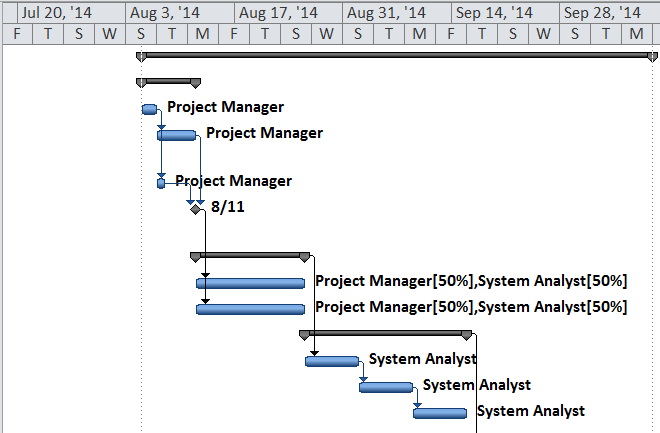 Creating the Gantt chart will determine time lines for planning, designing, executing and training. Below is a simple view of the entire project which involves the new process as well. CONTACTS will be an extension of CUSTOMERS and reports will be generated based on the types of contacts along with how often they're being called. Another report will be generated to show the percentage of sales that come from multiple completed TO DO's to prove that hard work is paying off, rather than a new lead placing a big order on the first call. However, this report may also show that some employees are completing TO DO's too quickly and they aren't getting as many orders as other employees. The difference between the two can be analyzed by viewing the completed TO DO's. There may be a simple explanation as to why there's a discrepancy, but either way, the managers can figure it out much quicker than they could have in their previous process. After the interviews and fact-finding sessions, the project manager will review everything and determine the necessary people we need to complete the full project. The project manager also creates the plan of attack in exact order, along with the cost to complete each portion. The project manager will take roughly 6 days to review the notes from interviews, create the business case document and create the project plan. If the amount of time doesn't fit within the budget we'll have to determine which portions are more important to WesBell, or approach them with a higher budget for their needs. Furthermore, our ideas for their system may not be the same as theirs, so it's important to discuss major project details before we spend too much time in areas that we find questionable. The systems analyst (me) will design the user interface of the new contact management system and make it look similar to the existing system. That will take about 5 days at $280 per day to complete. The user interface will need to be completed before I can start working on designing the data flow and processes. Likewise, the data flow design will need to be completed before the processes. 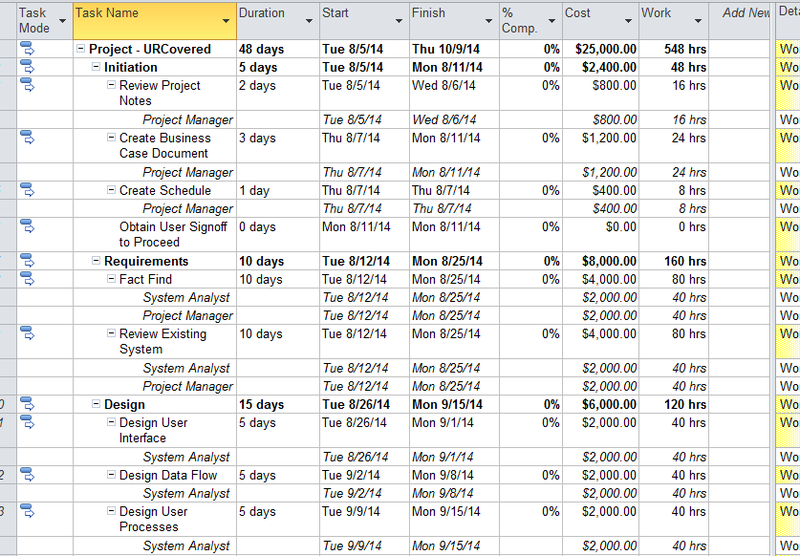 All three steps completed by the systems analyst will take a total of 15 days and cost a total of $4,200. You can see the tasks below, the cost of each and the length of time that each will take. You can also see the order in which tasks need to be completed because some are predecessors of others. Again, this is a good time to discuss each option with the customer so that we don't waste our time building parts of the system that the customer didn't ask to have done. The project manager will monitor the time tables for each portion of the project and quickly report back with any problems that may affect the completion date. Specifically, the project manager will make sure that the staff stays on task focusing on the necessary items and avoiding any glamorous additions that become a quick waste of time. Any new ideas will be treated as just that, new ideas that need to go through the planning process all over again. Making sure that our staff keeps their eye on the ball rather than working on things that we're not getting paid to do, will keep costs and time as originally planned and on budget. 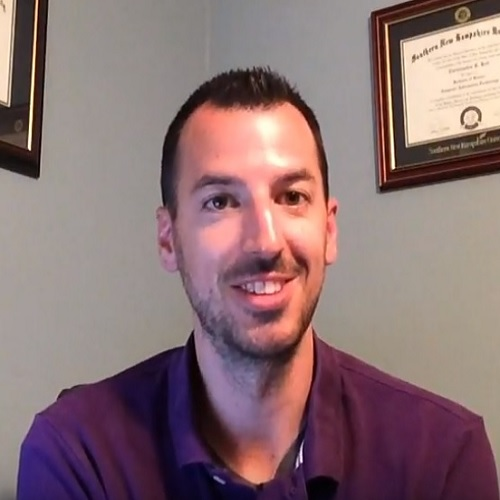 WesBell was clear about what they wanted for a system to help them achieve the next level of success and I have a list of requirements that will not only meet their needs, but also stay within their budget and time frame. These requirements were determined based on long hours of research, interviews and internal discussions and I plan to show you how we plan to complete this project with notes and visual diagrams. The system requirements will involve requirements modeling, data process model, data flow diagram, data dictionary, object modeling and use case diagrams that show a visual of what our plan is thus far. We'll also be looking for input from you to help us perfect each requirement. New requirements of WesBell's system will include additional outputs, inputs, processes, performance and controls integrated into a Customer Relationship Management system. We need to train them to input the correct data in order for us to output more accurate reports and useful information. A few additional inputs will include Contacts, the type of contact and the To Do's that were completed for the contact. With that information we can output the list of contacts by customer, a list of which types of contacts purchase the most, and a report that shows how many times a contact was called before an order was placed. We think these reports will help WesBell get more out of each customer they already have and be more organized with their 15,000 customers. Since the CRM technology helps each sales person contact more customers in less time, it can become difficult to remember everything. We'll train them to document every detail for their benefit later. WesBell will need to alter a few of their processes in order to capture all of the necessary data required for reports. For instance, instead of management telling the sales staff to call each of their customers, the process will be much more detailed to make sure they each document every step. It's no longer enough to simply verbalize your actions with your manager, it needs to be documented in the system so that the reports can output accurate data to the managers. A sales person must call the contact, document the conversation and set another To Do that will prompt them three months later. The new To Do should also include notes about the next discussion they plan to have, again to use less of their memory and more of the system. Any break in the process will alter the reports and soon make the reports void due to lack of accurate information. Each sales person will be held to a hirer standard than they once were in order to benefit the entire company, sales, profits and even commissions. In order to be sure that managers know their staff is calling all of the contacts on their list, a new procedure will be set to send managers a report each month that shows all of the contacts that haven't been viewed in 90 days. It may not be necessary for all contacts to be called every 90 days, but it's important for managers to see a list and determine themselves if a particular contact should be reached more often. Furthermore, each contact will have an ongoing list of notes that mention each conversation. That will give managers ideas of how to further train their employees that aren't doing exactly as the managers would like. The reports will be so easy to use that managers will be able to give sales people pointers after quickly viewing conversation topics and notes. Controls and security will be explained to WesBell so that they can pass on security features to their customers when needed. They are currently storing information about the customer more than the contact, so the contacts may want to hear a few words of honesty and safety before they allow WesBell to include their information in their database. WesBell needs additional controls on who can access different parts of the system as they increase in size and volume. We'll have to tread carefully in this subject because many of their employees where multiple hats and need to access all of the information, but there are many employees that don't need access and the system will be set as such. Security measures don't always relate to outside hackers, they can also relate to employees printing and selling reports or employees stealing identities themselves. That's why it's important to limit certain employees to only the parts of the system that they need access to. 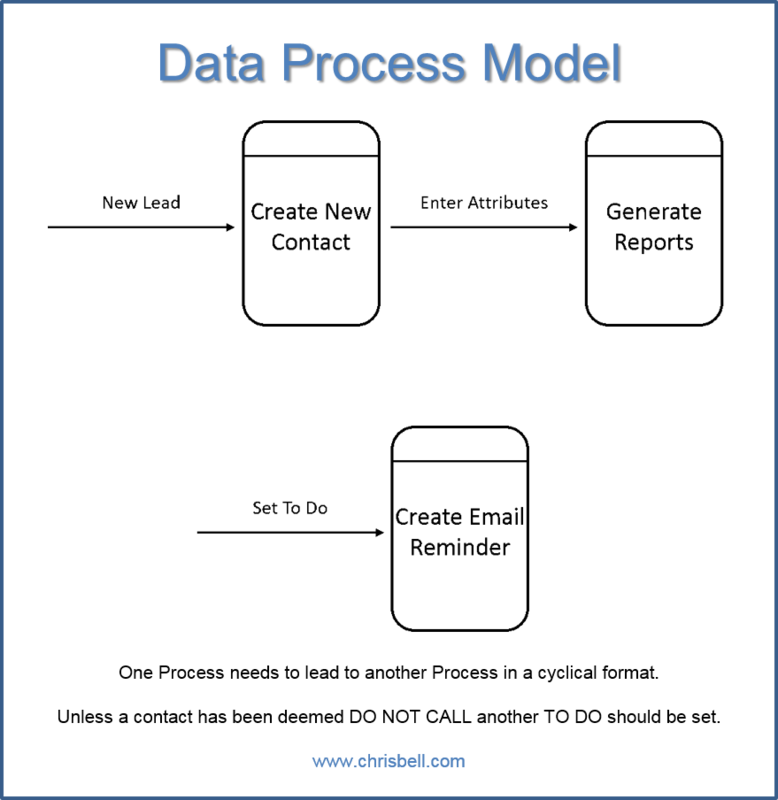 The data process model below shows two processes that the employee and the system will both need to understand. The first step of the process if for the employee to enter a contact so that the second step can be completed, which is to generate reports of the inputted data. The second process is to set a To Do which is a reminder to call a contact. Once the To Do is set, the system will automatically generate an email that reminds the sales person to call a contact. 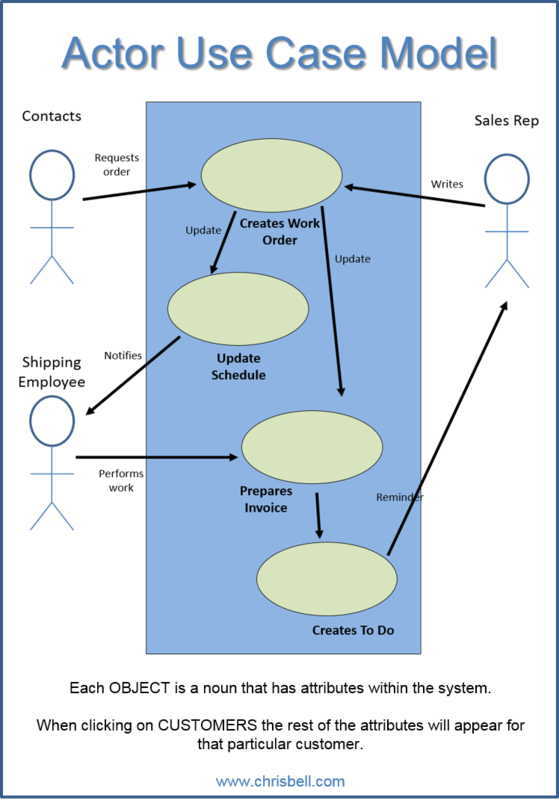 The Data Flow Diagram (DFD) below represents how the entire process happens from start to finish. A WesBell employee will get a new lead and follow the appropriate steps of entering the customer and contact into the system and setting a To Do as a reminder to call them a second time. They also must enter the necessary information so that the reports will generate accurate results. The data dictionary is a textual version of the data flow diagram. It lists all of the attributes, fields, entities and processes that are involved and need to be explained. Programmers will use some of this information to develop system restrictions and pop-up-information that explains things to the user. For instance, the acceptable values for entering a new contact are "any letters" which means a user cannot enter a new contact with the name "chris123". In the event that a user tries to enter "chris123" a pop-up may show up and explain to the user that numbers are not allowed to be used for a contact name. 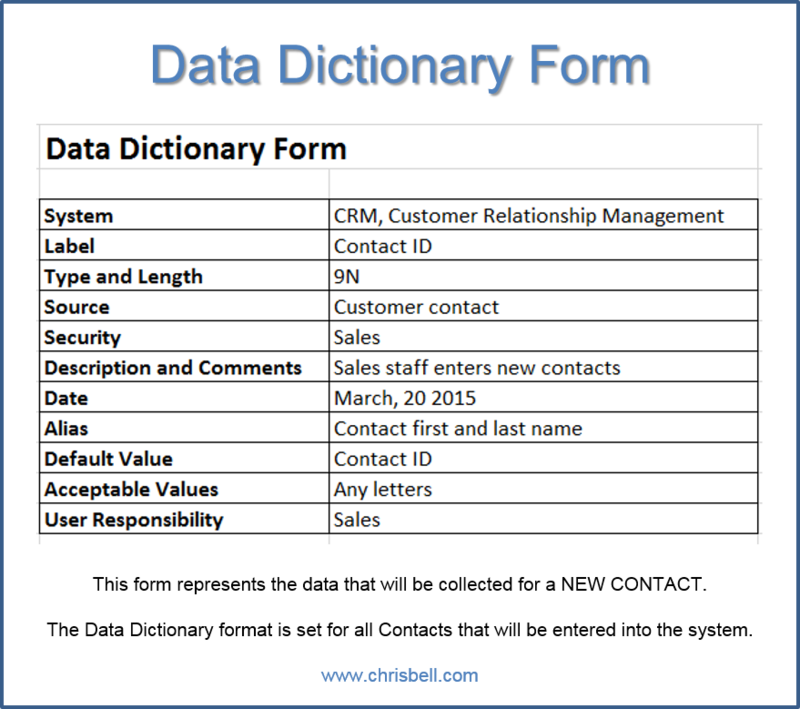 The data dictionary works as a glossary for some and as a set of rules for others. Some of the objects in our customer relationship management system include Contacts, Employees and Orders as seen below. These objects will need to interact with the system in some ways and be restricted from the system in other ways. For instance, contacts should have very limited access to the system while employees will have much more access. Relationships are going to be developed between these objects as such: Employees can have many contacts, but contacts can only have one employee; Customers can have many contacts, but contacts can only have one customer; and contacts can have many orders, but orders can only have one contact. Each relationship is important to the system because it lays out rules that cannot be broken. For example, the user cannot enter an order without first picking a customer. Though it may seem beneficial to create one order for many customers, it would just cause problems. Also, in order to create a contact the user must first enter a customer because the contact is directly related to the one single customer. Therefore, we'll specify each relationship within the system as part of the overall architecture. 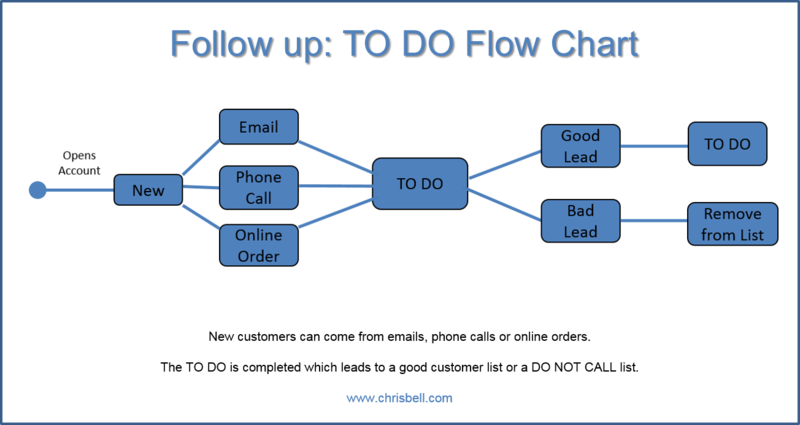 The use case diagram below shows how an order process will flow and how the sales person will be reminded to call the contact at a later date. First, the contact places an order on the phone, then the sales person enters it into the system. Once the system receives it there will be a pick ticket sent to the shipping employee for him or her to prepare and ship the order. Then the act of shipping it creates an invoice and automatically emails it to the customer. At the same time, the shipped order will create a new To Do for the sales person to connect with the contact and discuss future business. The reminder To Do will be set 3 months after the order ships and the sales person will be expected to call the customer, visit the customer or send additional information. The To Do process is meant to be an ongoing process, so in order to make sure their sales staff doesn't forget, we'll set a prompt that asks, "Do you want to set another follow-up To Do?" as a reminder. I believe the use case diagram below will be a helpful training tool rather than a presenting them with a bunch of technical jargon. Since you, the IT project team and IT management team, have both agreed that the CRM project should continue to the next stage of systems design and architecture, we have created a much more specific design that reflects more than we discussed in the analysis phase. You're about to see our vision through specifications, data design, and user interface design along with a full understanding of the system architecture and feasibility analysis. I'm happy to report that the project is being completed as scheduled. We haven't used any additional time nor have we used any additional funds to reach this point. The models are nearly complete, but we would like to get your feedback before spending any more time designing. The specifications diagram below represents how we're designing the entire customer relationship management system for WesBell. Their current process is quite similar, but manual instead of system driven, which means they will already be prepared to capture most of the information. Once we implement the system we'll have to train them to avoid using notebooks and start entering everything into the system. We were much less specific about the requirements in the systems requirements document than we will be in the systems specifications document. This document is going to zoom in on the requirements and discuss the attributes of each class and object, the relationships between each, the primary, foreign and associative keys along with the role that each plays in the overall system. 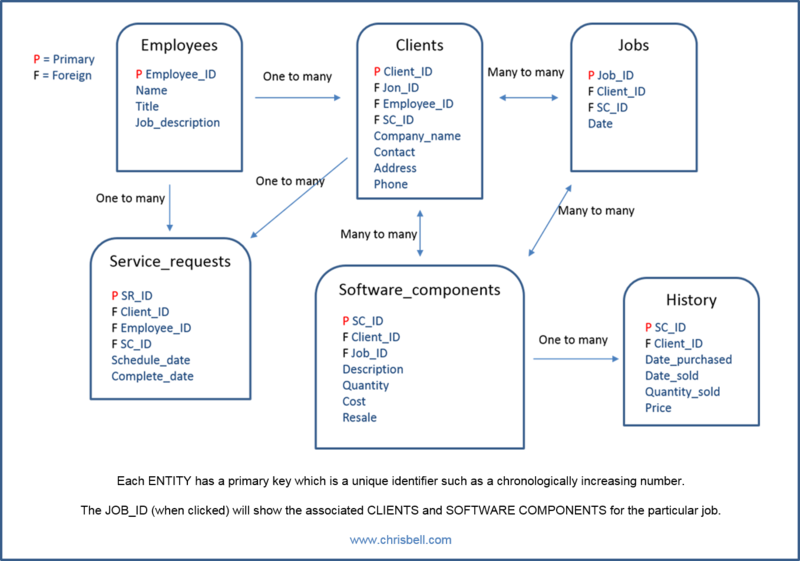 The data design includes entity relationship diagrams (ERD) that accurately describe the attributes, keys and relationships. 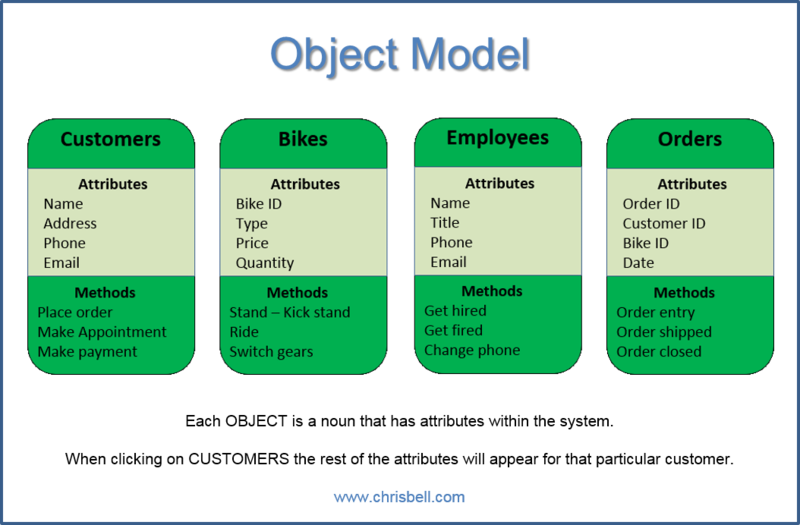 The picture in the last section describes the process flow more than the relationships between each object. See the ERD below to view the fields that will be displayed when each object is viewed. For example, when someone wants to view CONTACTS by SALES PERSON, the system will display Sales_ID, (Contact_ID, Name, Title, Job_description). CONTACTS can be viewed without first selecting a Sales_ID, however it will simply display all of the contacts in no particular order. We prefer to use a primary key of Sales_ID and a foreign key of Contact_ID so that the contacts are viewed through the sales person that handles the account. When viewing TO DOs the user will want to know which sales person handles the account and which contact the TO DO is set to call. Therefore, the foreign keys are connected, or related, to those two objects. If WesBell decides to have more information in any particular table we can create more foreign keys to allow them to view more data on a single screen. However, we'll start by designing the system with standard protocol and wait for feedback when the users test the system. QUOTES and ORDERS both have similar data, keys and relationships in the diagram. A customer, or contact, should be called after a quote and after an order, so both have TO DOs as foreign keys. Also, WesBell mentioned that they wanted to be able to see how many orders were placed by each CONTACT, rather than just by CUSTOMER, which is referenced in this system. Notice that both QUOTES and ORDERS have a foreign key of Contact_ID to include the contact that placed the order. A more in-depth overview of the system would also include Customer_ID. Designing the user interface would be much easier if all users were as educated as the programmers, but they aren't so more functionality needs to be considered. For example, some users prefer to use a mouse to click links while other users like to type in commands. We already have codes set up that allow users to type commands if and when they decide to. Instead of clicking on ORDERS, then clicking on ORDER ENTRY, we set up a short code of OE that will bring up the order entry screen immediately. Likewise, we set up a short code of QE for entering quotes and NC for entering a new customer quickly and easily. We'll keep the short codes consistent with each other and be sure not to confuse users with codes that could mean multiple things. As you can see in the image below, there will be a designated box to type in commands, along with a link to see all of the available commands. If WesBell likes using the short codes we can generate more once they determine which parts of the system they want to get to faster than clicking. When the user clicks on SALES ORDERS it will add a shadow in the box and bold the letters. Also, when clicked, the right hand display will include additional choices related to sales orders for the user to choose from. In the bigger picture, CONTACTS would actually say CUSTOMERS and contacts would be an option once CUSTOMERS is clicked. The user would have to enter a customer before entering a contact, or choose a customer and enter a new contact for that particular customer. Also, once the user enters a new contact the system will prompt the user to create a To Do. If the user closes the box instead of entering a To Do they will be prompted to add a note as to why they don't need a To Do. The system architecture was built around the current processes and procedures of WesBell so we believe it will fit well with their corporate organization and culture. The simple difference can be explained as documenting instead of trashing. The notebooks that they currently use never get analyzed later. We will be implementing a CRM to their current ERP system even though we feel that the SCM system could be more effective for the company. There always seems to be something better available, however "better" comes with a higher price tag along with a higher total cost of ownership, TCO. It's more effective and still much more efficient, to implement a CRM to the existing ERP system. Not only will there be far less planning and implementation, but there will be less training on a new architecture and less ownership fees on a monthly and annual basis. During the interviews with WesBell we discussed scalability, but their current ERP system is already prepared for it. It has "01" and "02" locations and they currently use the second warehouse for inventory only. Their current system also has plenty of room for new customers and contacts before running out of digits for customer numbers. They don't have plans for becoming national any time soon. 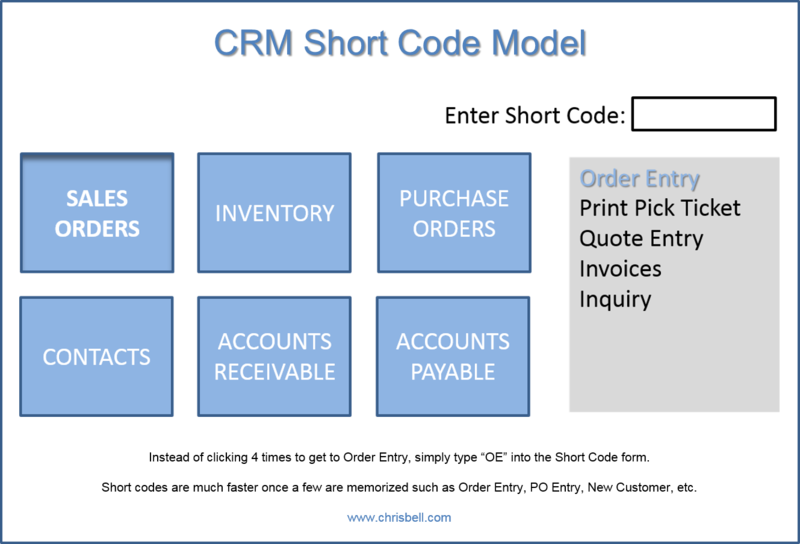 This is a cookie-cutter integration of a CRM to their ERP. Most of the reporting and classes are derived from the list of contacts, where they are geographically, which sales person is assigned to them and how many To Do's have been completed. Added security will be implemented to alter credit card numbers into codes that cannot be seen by the users. Otherwise, WesBell's ERP is set up with security features that block sales people from seeing accounting and block production employees from viewing anything but inventory. We may also consider certain security of some employees from accessing the customer relationship management system because it includes people's personal information that they may or may not want available to the entire company. WesBell's current credit card procedure is not secure for the card holder because they write them into note books and on scrap pieces of paper that may not be disposed of correctly. We ask ourselves this question every time we purchase something; is it feasible? WesBell currently has a few problems that will be solved. First, they document everything in notebooks and have trouble analyzing how and why they got orders. Secondly, the managers don't exactly know if their sales staff is completing all of their To Do's or how many phone calls it takes to achieve an order. Lastly, WesBell cannot determine which contact at a company placed an order other than by memory or sifting through notebooks. We plan to specifically address each of these concerns of WesBell while we implement the system. We'll also be sure to train them on the problem areas to make sure they're satisfied with the total cost of ownership down the road. The system implementation phase will be a slow process to ensure the end product is everything WesBell has imagined it to be. First, we'll implement a mock-system for them to analyze and demo while their current system is still fully functional. After they use the CRM for a few days we'll touch base with them to obtain feedback about the system design and architecture. We're looking for more information in this phase than, "I don't like how it looks." We'll ask probing questions that helps us determine if the system will integrate well with their current process, and if not, we'll update the system so that it does. We'll be alert when the users are giving feedback so that we truly understand their needs instead of telling them what they need. As the systems analyst I'll make sure to translate their words into programming features that our design team can complete. We included time and money in the budget for training the employees, but it was in the form of hours, not weeks or months. There are only about 20 employees that will be using the system, and frankly, WesBell's managers need to spend their time training the employees to complete a slightly different process when they generate a new lead. Even if the system is fully functional without any errors, users inputting incorrect data or forgetting to input certain parts of data, will severely disrupt how the system talks back to them. Therefore, we'll make sure to tell their managers that they are involved in the training process as well, and that their lack of training will affect how they feel about the price of the system and how they feel about us as a software company. After a few visits back and forth we can revise the system with all of the updates requested by the customer. In this case, WesBell only has one location, so the changeover shouldn't disrupt too many daily activities. Also, a CRM system and all of the changes to the processes and procedures are in addition to their current workload. In other words, their current system is still their main RDBMS and the CRM is an addition, not a complete change. They can still write notes in their personal notebooks until they feel comfortable enough to enter notes directly into the system. However, all of their notes need to be transferred into the database or reports will suffer later. "Garbage-in equals Garbage-out" is the saying that's been beaten to death in the IT industry, however common knowledge to us may not be common knowledge to the customer. After roughly one week of testing and another week of updates, we'll be prepared to implement the system for good. We'll have to wait a few months for data to build before we can discuss the how to run reports by CONTACT with the managers of WesBell, but until then we'll continue to encourage them to enter as much data as they can. When we revisit WesBell in a few months we'll make sure to show them how efficient their new reports are based on the information the inputted. If and when we see empty data fields we'll be sure to give them examples of how reports will suffer until they enter the information completely and correctly. The evaluation phase consists of us visiting WesBell a few months after the full implantation is complete. We have included it in the project time table and budget. We have also discussed the total cost of ownership with WesBell so that they are prepared for annual support and possible fees. The evaluation will be similar to the two-week evaluation, but we expect far less questions and concerns this time around. We want to be sure that the users, management team and IT staff are all happy with the new system. We want to also make sure that everyone has access where they need it and that there haven't been any security issues. Security needs to be watched very closely during the first few months because simple human errors can create major problems within a system. It can be detrimental to have a security issue during the first few months because we may lose trust with the customer. The amount of support needed will slowly diminish as months go by, so it's important to seriously consider each and every concern as a continuous improvement initiative. The ISO standard nearly forces companies like ourselves to continuously improve their processes and procedures because, in business, standing still is equivalent to falling behind. Each visit will start to get farther and farther apart because they will be more comfortable with the system and its new features. However, as a company in business ourselves, we want to also try to sell them additional upgrades and features down the road. We'll have to continue to let them know that we're here and that we didn't just implement the system and disappear. In order to achieve additional business we can use a suggestion box format where the users are encouraged to anonymously offer their comments and opinions about certain features of the system. They will also be told to write down suggestions of additional features that they might want more literature on. Implementing a new system years ago was quite different because annual support wasn't as popular as it is today. However, users became more and more confused as systems got more in depth with features, so support on a monthly and annual basis became necessary. In fact, many companies today are in business simply to support software that manufacturers develop and don't want to support themselves. The new term is TCO, Total Cost of Ownership, and it's very important to understand as the consumer and the manufacturer. Kelly Blue Book now offers a total cost of ownership price next to the resale price of cars. For instance, sometimes an expensive car has a lower TCO over five years when compared to lower priced truck. Trucks have large wheels, bigger frames, bigger engines and other more expensive items that, over time, outweigh the total cost of owning a more expensive priced car. Gas and oil changes were also used in the comparison on KBB. As you can see in the example below, two sedans have the same price tag, but different total costs over the course of 5 years. WesBell will be much more efficient with a CRM system added onto their ERP system because they will be able to do more with less people and manage their employees much more effectively. Additional inputs directly relate to the additional outputs that they requested at the beginning stages of the project. We met all of their needs without under-performing or over performing in any categories. Under-performing leaves the customer feeling like they didn't get what they wanted for the amount they paid, but over performing means we would have had to charge them additional money or simply lose money ourselves. We met a happy medium by supplying everything that the customer asked for at a fair and reasonable price. We also completed the project on time which is good for our budget and good for the customer experience. We need to continue to impress WesBell through monthly support of their new system. Rosenblatt, H. (2014). Systems Planning. In Systems Analysis and Design (10th ed.). Boston, MA: Cengage Learning.